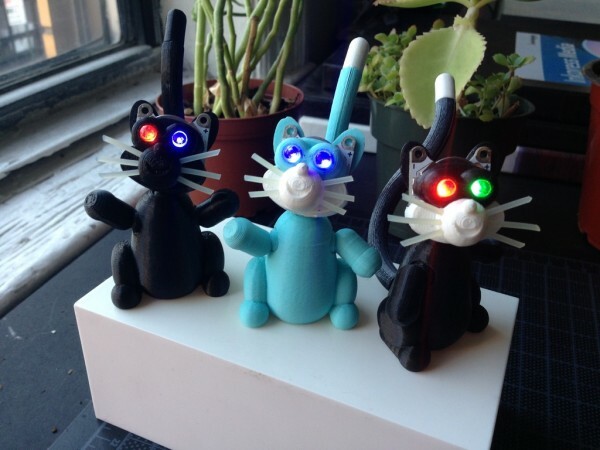 Blinky Kitty #3DThursday #3DPrinting « Adafruit Industries – Makers, hackers, artists, designers and engineers! You always wanted a kitty with blinking LED, rainbow eyes, right? Blinky Kitty has a posable head, tail, arms, and flexible whiskers. A tilt switch inside the tail activates Blinky Kitty’s mesmerizing, rainbow, color-changing eyes. Exposed battery terminals at the ears let you use Blinky Kitty as a 3V coin cell battery supply too.